The 2016 year-end statistics are in, and Boulder County remains the best place in the United States to own a home. Colorado — At 10.03 percent, Colorado had the fourth-fastest-appreciating market in the country, though that is down from last year’s 12.66 percent, according to the latest Federal Housing Finance Agency index. [FHFA statistics are through the third quarter, 2016. All other statistics were taken from IRES LLC on Jan. 10, 2017, and prepared courtesy of DB Wilson, of Re/Max of Boulder Inc.
Colorado has enjoyed more home appreciation than any other state since 1991 — now an eye-popping 296.4 percent. 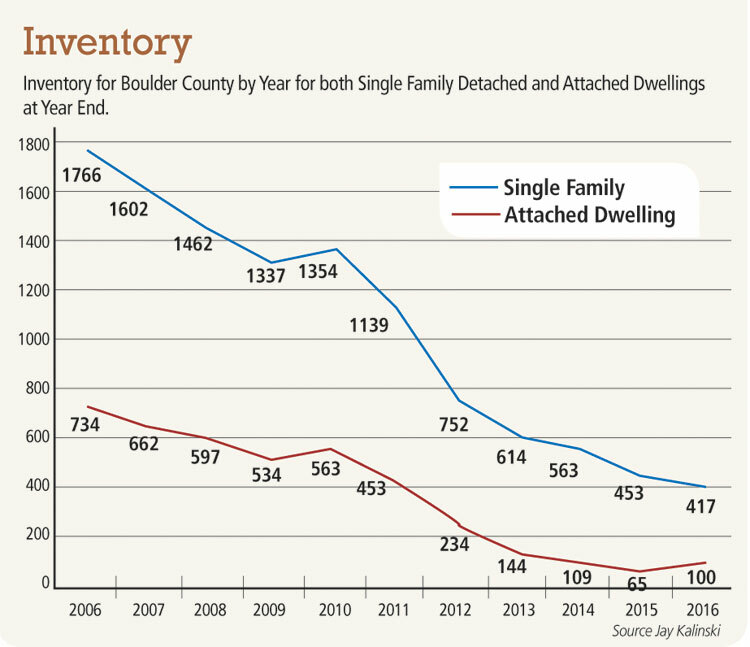 Boulder Valley — Home appreciation in the Boulder Valley likewise has been impressive. Boulder, at 10.56 percent, had the seventh-highest appreciation of any metropolitan area in the country in the past year. Since 1991, Boulder home values have increased more than 336 percent, more than 40 percent over any other metropolitan area in the country. 1. 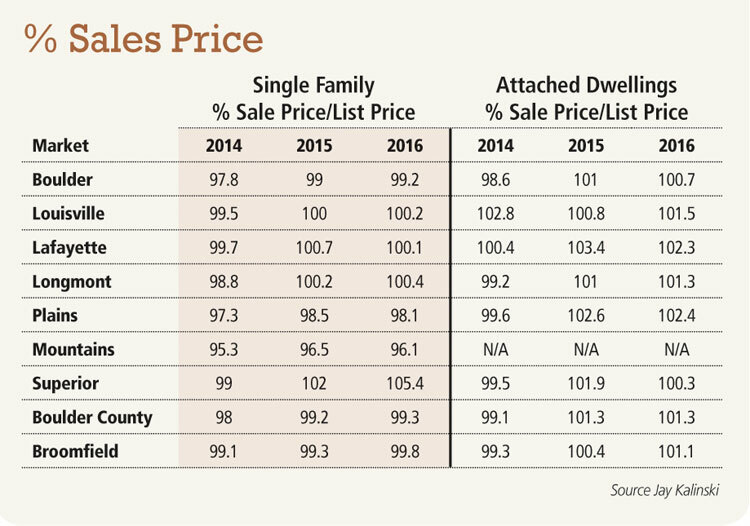 Average sales prices were at all-time highs for every market in Boulder and Broomfield counties for the second year in a row. 2. Inventory of single-family homes were at all-time lows, but attached homes were up slightly (see below). 2016 was an excellent time to sell, as inventory and interest rates were low, and buyer demand and appreciation was high. The indicators for 2017 are more mixed than they were in 2016, meaning that the market may be shifting slightly toward buyers (but increasing interest rates could take some buyers out of the market). 3. Average sale-price-to-list-price ratios for single-family homes in Louisville, Lafayette, Longmont and Superior remained over 100 percent; for attached dwellings, every market in Boulder and Broomfield counties averaged over 100 percent (see below). 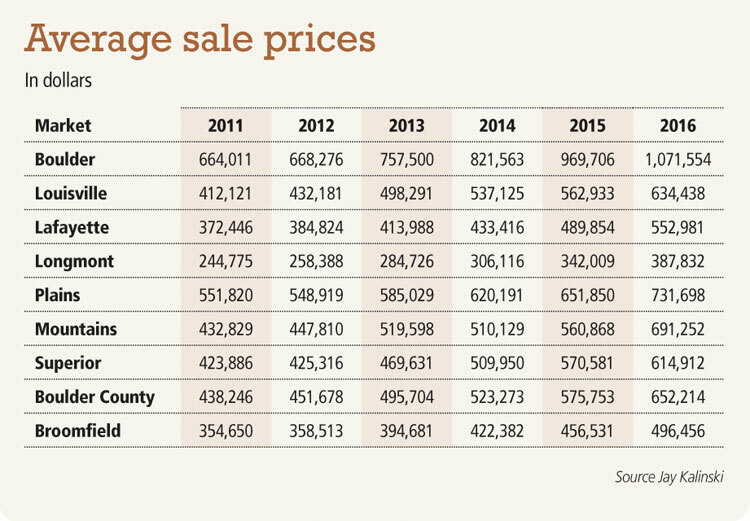 That is, properties in those areas sold on average for more than their asking price. For sellers in these markets, you likely had multiple offers to choose from when selling your home. For buyers, this meant that you should have been prepared to pay above asking and potentially waive contingencies if you wanted to compete in the market. However, you may note that these rates slowed or, in some cases, even declined, which is another signal of a slight shift in the market. While 2016 continued to be a strong seller’s market, there are indications that in 2017 the market may be shifting slightly away from the torrid appreciation pace we experienced for the last several years. 2017 could be a better time to be a buyer, especially if you can close on a home before interest rates continue their climb.